Creating work stations in the kitchen for a particular purpose makes it convenient to organize a kitchen designating one area for that purpose. 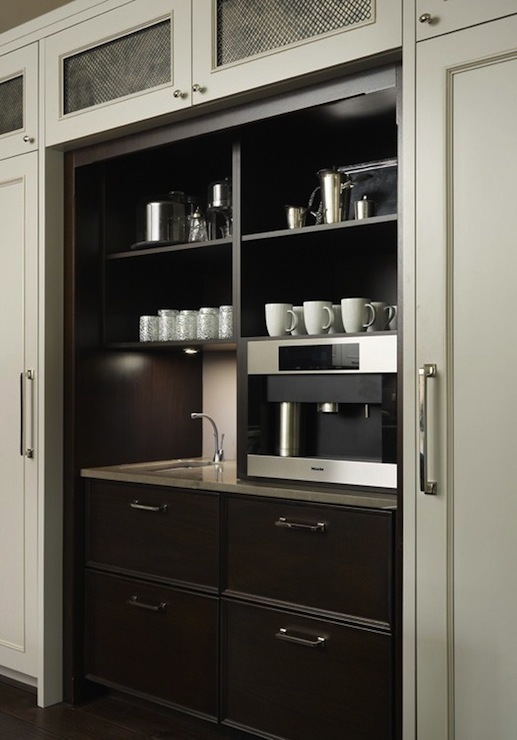 For example a Coffee Station comprising of a coffee grinder, a brewing machine, an espresso, storage container for coffee seeds, coffee accessories storage drawer, shelving for coffee mugs etc and all that contained inside cabinet doors keeps all doubts away to search for each particular item. Getting up from and bolting for a designated location in the kitchen to get the morning coffee becomes an easy task and brings satisfaction to that coffee connoisseur in the family. The other unique advantage to stowing away appliances and accessories that we use daily in one area is finding them when needed. This makes our job easy of daily cleaning, winding the cord and putting away. A combination of pull out drawers and fixed shelves both for tall and short items as well as appliance attachments are a great way to keep it all organized and ready to use. Under counter lights, over head lights makes it a comfortable morning and evening station for your coffee or smoothie and then cleaned up and forgotten once the sliding doors are closed. These compact stations are perfect solution for small size apartments where one space is for multi-use activities. A complete kitchen unit with a small cooktop/microwave hood combo as well as a small sink and storage can also be housed with the proper ventilation to be a functional cooking-eating-sleeping area in the present day one room condo that is selling around town.